The state champion Versailles girls basketball team waves to the crowd Saturday. The Winery at Versailles won the theme award for Saturday’s Grand Parade. Midmark won the commercial award for its parade float. The Brillliant Beginnings float was selected as the winner of the Queen’s Award in Saturday’s parade. 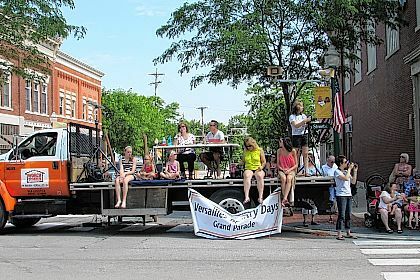 The annual Grand Parade begins at the 2015 Versailles Poultry Days Saturday morning. Members of the Versailles High School Marching Band pause during the Poultry Days Grand Parade to perform the “chicken dance” Saturday afternoon. Parade Grand Marshals Bob and Kathy Frey wave at the parade announcers as they pass by in Saturday’s Poultry Days parade. The 2014 Miss Chick Elizabeth White and her court, first runner-up Courtney Rose and second runner-up Cassidy Condon, wave from the popular giant chicken float during the 2015 Poultry Days Grand Parade Saturday. The Little Miss Poultry Days contestants wave from their float Saturday.